Congratulations to staff of the Paringa Unit. Left to right: unit director Dr Manoj Narayanan, nurse unit manager Nirav Thakker, mental health director of nursing Charles Macmillan, registered nurse Raksha Darshini, consultant psychiatrist Dr John Cottrell-Dorma, registered nurse Bhavanaben Prajapati, medical secretary (wearing red scarf) Anju Binoj, registered nurse Maria Abella, ward clerk Nimisha Acharya and clinical support officer Christina Pratts. Cumberland Hospital nurses were treated to a BBQ and night staff received pizza to help celebrate International Nurses and Midwives Day. The Ward of the Year award was also presented to the mental health nursing team that had demonstrated outstanding effort in the pursuit of excellence. Mental health director of nursing, Charles Macmillan said it was always a difficult decision to choose a winner. “This year was no different,” he said. And it was the Paringa Unit which took the honours. 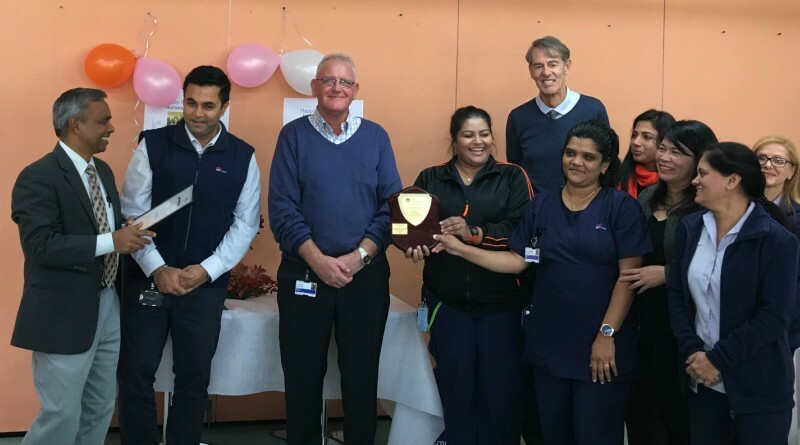 “This team won the award for their effective multi-disciplinary approach and commitment to quality mental healthcare led by two nurse unit managers over the past year – Nirav Thakker and Alexander Sepulveda – in collaboration with Unit director Dr Narayanan and the medical and allied health teams. “I’d like to thank and congratulate all staff and teams for the dedication and commitment they show on a daily basis to our patients,” Mr Macmillan said. Mental Health Nurse of the Year – Blacktown Melaleuca Unit clinical nurse specialist Anthony Clark. Exemplary Contributions to Mental Health Nursing Practice – Cumberland campus Acacia nurse unit manager Ajit Singh. Exceptional Commitment to Patient Care – Cumberland campus Paringa Unit registered nurse Maria Abella. The People’s Choice Award for Mental Health – Mental Health nurse educator Gail Honeman. Redbank House registered nurse Elisssa Yoo, Riverview nurse unit manager David Gollan and Statewide Outreach Perinatal Service for Mental Health clinical nurse consultant Karen Hazell Raine, also received recognition for their commitment and dedication to patients. Redbank House registered nurse Elissa Yoo, mental health director of nursing Charles Macmillan with Riverview nurse unit manager David Gollan at the WSLHD International Nurses and Midwives Day ceremony. State-wide Outreach Perinatal Service for Mental Health clinical nurse consultant Karen Hazell Raine.